This VacuEasylift vacuum lifter has a special tool designed for lifting and handling rubber tyres. 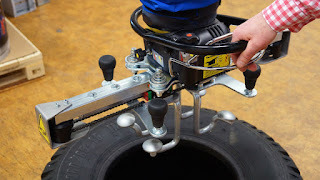 The suction foot is equipped with a special synchronized double hook tool. When the operator adjusts one hook on the tool the other hook follows in sync. This assures that the vacuum lifter is always positioned in the centre. Thank you for your positive feedback. Starting with a free platform is a good idea, there are some great free options. Good luck with your website.